Not quite sure what to give the sausage maker in your life? 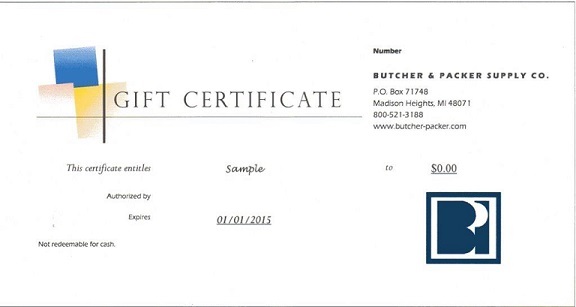 With a Butcher & Packer Gift Certificate, it will be simple and easy for you to please that special person. Our Gift Certificates come in denominations of $25, $50, $75, and $100. Each Gift Certificate will be mailed with our current catalog to the address you provide. Please call 800-521-3188 to request a gift certificate.